From the first moment I talked with Michelle, I knew that we were going to hit it off! She has such a warm personality and you could tell from how she talked about Paul that he was such an important part of her life. The same could be said of Paul and his love of Michelle! Importance of family is also a huge part of who they are as a couple. This awesome couple took the time during their reception to personally greet and thank every guest for attending their wedding. Michelle and Paul put so much thought and care into their wedding details to create a wonderful experience for their guests. 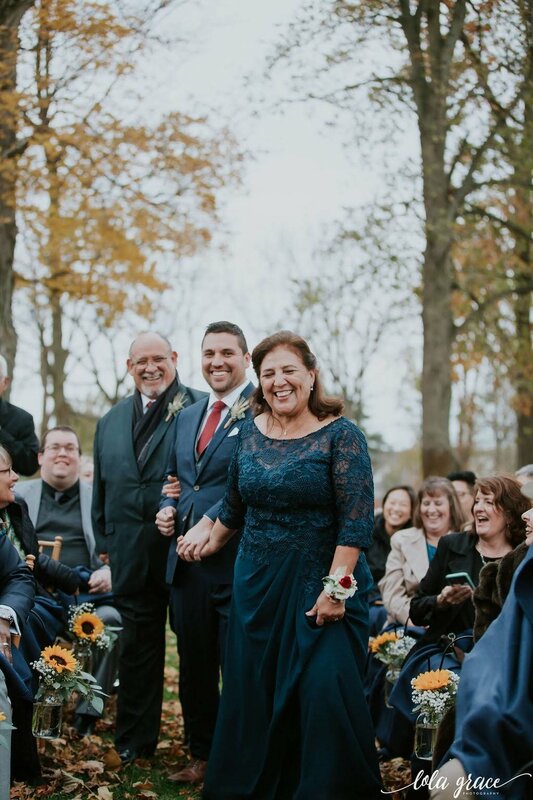 Their November wedding took place at the beautiful Zingerman’s Cornman Farms in Dexter, Michigan. It was the perfect fall day; not too cold, overcast skies, still some color on the trees and leaves rustling around in the breeze. 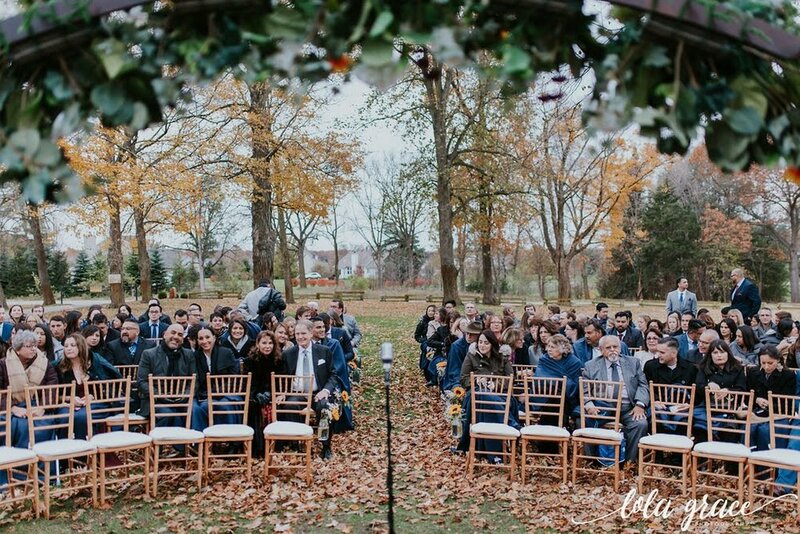 Michelle and Paul read their vows in front of the iconic white farmhouse with their guests snuggled up with navy monogrammed blankets, which served as favors. After the ceremony, cocktails and appetizers were served lower level of the historic red barn. 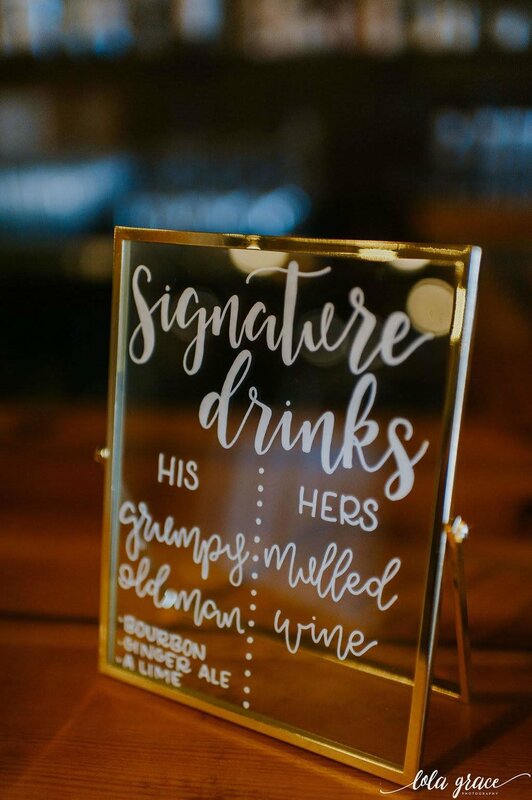 Signature drinks included the bride’s favorite; mulled wine and a grumpy own man (bourbon, lime and ginger ale) for the groom. Guests also enjoyed lawn games and some special visitors; goats! A custom wooden mirrored seating chart, created by Mitten Script by Marah, guided guests to tables named after the bride and groom’s favorite ballparks. Paul and Michelle’s dinner took place in Zingerman’s reception tent adorned with bistro string and Edison bulb lighting, installed by Quest Productions. Their deep navy and burgundy color palette was enhanced by their wheat and fall floral centerpieces by Happiness Is Flowers. Guests dined on delicious entrees of salmon, farro and roasted chicken from Zingerman’s Catering in an intimate candlelit atmosphere. Zingerman’s Bakehouse created a birch tree inspired naked cake for our couple adorned with a vintage red truck cake topper, which resembled one that the groom’s grandfather had owned. The Block Party kept the dance floor packed for the rest of the night with a s’mores bar, cake slices and cocktails to enjoy during dance breaks. Congratulations Paul and Michelle; your wedding day was magical! Photography by Lola Grace Photography. All of those perfect metallic details for this flat lay. Note to every single bride; have a killer pair of reception shoes! Beautiful Michelle getting ready for their first look. Paul had his suit jacket embroidered with their wedding date! What a great keepsake from their wedding. The perfect fall suit and boutonniere combo for this handsome groom. Paul and Michelle wanted to include one of their favorite quotes from “The Sandlot” on their ceremony sign made by Mitten Script by Marah. Guests snuggled up in custom monogrammed blankets for their breezy outdoor ceremony. Everyone getting cozy and ready for the ceremony to begin! So much happiness in one photo! The perfect fall day paired with knit shawls and warm hearts. Everything about this photo shows how in love Paul and Michelle are. Cocktail hour was filled with mingling, great drinks, patio heaters and more importantly…goats! Signature drink options for the crew were grumpy old man and mulled wine. Guests filled out this handmade scrapbook with candid photos and memories. Paul and Michelle picked out this custom framed mirror for Mitten Script by Marah to create their seating chart then use in their home after the wedding. Their meaningful cake topper was modeled after Paul’s grandfather’s truck. The Edison bulbs lighting installation highlighted Paul and Michelle’s wedding cake. Just the right amount of fall decor for their centerpieces. This is what it looks like when pure love and cake meet. These two, this night and a lifetime of happiness.